Atlantic Coast Crushers manufactures and sells crushers, lumpbreakers, pulverizers, granulators, comminutors and other size reduction machinery for the chemical process industries. 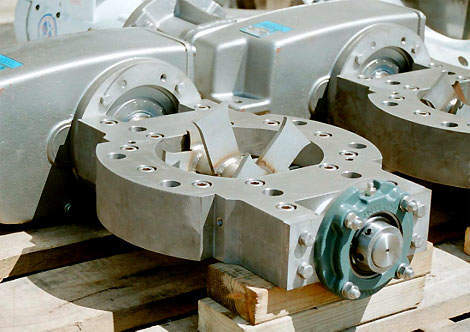 We specialize in designing crushers and lumpbreakers, machinery that uses impact to shatter chunks, lumps, and agglomerations formed from friable materials. Reducing large, oversize chunks of material to a consistent, free flowing size allows product transport equipment to run at peak efficiency by removing potential line blockages before they occur, and also by increasing the available product surface area, which allows reactive processes (mixing, melting, dissolving, etc.) to occur more quickly and completely. One of the standard machine designs described below is suitable for most applications. 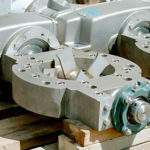 However please note that because of the diverse nature of our customer base Atlantic Coast Crushers is constantly creating new custom designs and/or variations of existing units for specific applications or processes and we can accommodate many special requirements. 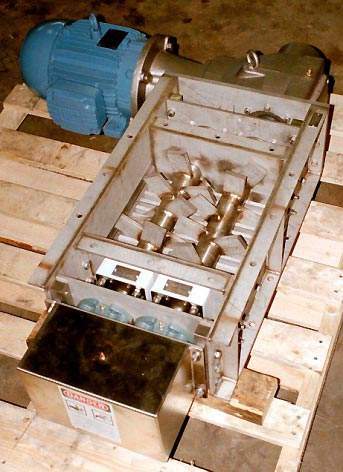 The Flow-Sentry is a fully enclosed crushing device that employs a single set of rotating blades to impact and shatter, at close clearance, any large lumps or chunks of material as they travel through the impact area of the machine. Although well suited for protecting pumps or preventing clogs in pressurized piping systems, the Flow-Sentry has a versatile design and can be incorporated into bulk bag unloading systems, storage silos, reactor vessels or similar locations. The patented design of the Flow-Sentry also allows us to offer the machine with most common flange styles, i.e. ANSI or DIN Pipe Flanges, sanitary ferrules, etc., custom fabrications or with our very short face-to-face ‘wafer’ design, for easy integration into existing installations. Flow Smasher Crushers are heavy duty, high torque and high capacity crushing machines capable of reducing large chunks of friable bulk materials to a consistent and free-flowing size. This prevents blockages in material transport systems and improves the efficiency of subsequent production processes. 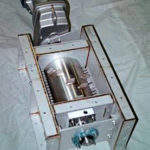 The Flow-Smasher Crusher designs employ a dynamic crushing action to break up and disperse troublesome oversize materials. The Flow-Smasher is available in numerous sizes and with several different blade/shaft configurations, including the ‘Brick-Breaker’, ‘Hedgehog’ and ‘Bear-Claw’ designs, which allow us to break down a variety of troublesome materials. 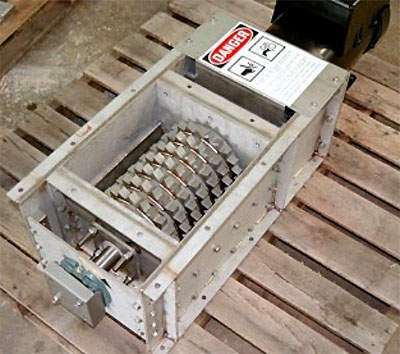 The Flow-Sizer is an economical, heavy-duty crusher designed to reduce dry bulk materials to a consistent, fine, free-flowing size. It employs a dynamic crushing action to break up and disperse troublesome oversize materials. The Flow-Sizer has short blades, which allow for a very effective crushing action, producing a fine output size at high capacity. Standard inlet sizes are readily available up to 12in x 48in, with additional custom sizes and materials as required. The Particle-Sizer is a compact device with a high output capacity that can be used to reduce large chunks or lumps of dry bulk solids to a fine powder. 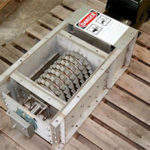 The Particle-Sizer uses a high-speed rotary cutter to sweep the solids past a series of sharp stationary cutter bars mounted in a ‘Sizing Cage’. 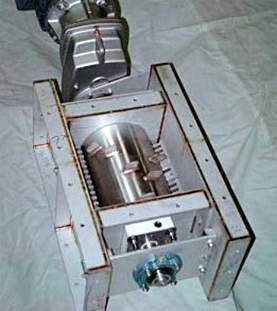 The Particle-Sizer can be used by itself with moderately oversize materials or in combination with one of our other crusher designs for very large chunks, and optional cutter designs and cage sizes and a variable speed motor allow for output size adjustability – reductions can be as small as 150micron in some cases. 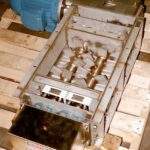 Atlantic Coast Crushers manufactures and sells innovative size reduction machinery for use in the chemical process industries.